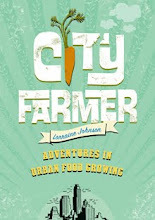 This summer, I was very excited to grow a number of vegetable plants I'd never grown before, such as okra, ground cherries, and cardoon. Farmers (along with gardeners) in Ontario are expanding their palettes to include "world crops"--that is, vegetables available in grocery stores as imports but that can (and should!) be grown commercially here in Ontario. The event is free of charge and will, I'm sure, be lively and engaging. Hope to see you there.